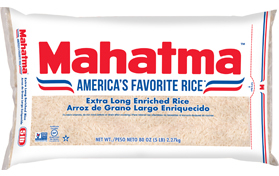 Mahatma is America's favorite long grain rice. For over 93 years, Riviana Foods Inc. has been packaging and marketing rice for the U.S. consumer. Known for its consistent high quality, Mahatma rice is the preferred brand among many families. Mahatma rice is available in a variety of sizes from 1lb. to 20lb. It's easy to prepare, economical, versatile, and a healthy complement to any meal. Mahatma rice is grown in the U.S.A. and is Kosher approved. Families can trust Mahatma to cook into fluffy white rice. Mahatma rice is naturally sodium free, cholesterol free, and fat free. The Mahatma brand of rice was introduced in 1932. Having many of the table characteristics of the India Patna, it was named "Mahatma" which means "outstanding" or "superior" in character. The Genie character was first used in an advertising campaign and called "Little Man." It became a registered trademark for the Mahatma brand in February 1955. Bring 2 cups of water to a boil in a 2 quart heavy saucepan. Add margarine and salt, if desired. Stir in 1 cup rice. Cover, reduce heat and simmer for 20 minutes or until all water is absorbed. In a 2 quart microwave safe dish combine 2 cups water and 1 cup rice. Add margarine and salt, if desired. Cover and microwave on HIGH for 5 minutes. Reduce setting to 50% power, microwave for 15 minutes or until all the water is absorbed. **It is recommended that only 1 cup rice be prepared in the microwave at a time. Microwave ovens vary. Cooking times are approximate.